Shirley Jean Seidel, 90, of Schroeder, went to be with her Lord and Savior on Monday, January 21st while wintering near Florence, Arizona. She was born on June 26, 1928 to Elfred and Anna (Swanson) Johnson in Chicago, Illinois. Shirley spent her first five years in Chicago and, after her father passed away, the family moved to Minneapolis in 1933. She graduated from South High in 1946. Shirley married Bob Seidel on March 10, 1951 in Minneapolis. Together she and Bob made their home in Richfield where they raised their four children. Shirley was a homemaker and served in many different capacities at Bethany Covenant Church - Youth Group Leader, Camp Counselor, Church Choir, Vacation Bible School Leader, Sunday School Teacher and was a mentor to many young people. Most of all, Shirley was known for her giving heart and strong faith - to both family and friends alike. She always made everyone else feel extra special and looked for opportunities to bless others. Sometimes this was a timely note with just the right words, a welcoming hug and smile, a word of encouragement or knitting prayer shawls for people she didn't even know. She modeled to everyone how to think of others first - how to bring them joy and be there when they were in need. She loved unconditionally. After Bob passed away in 2008, Shirley continued to live up the North Shore in the home they built together on Lake Superior. She loved living along the lake and especially marveled at the power of the waves during big storms. She loved her family, her friends, her church community - and was loved greatly in return. She also enjoyed attending UMD Women's Hockey games. Shirley passed away at her son's home in Arizona. 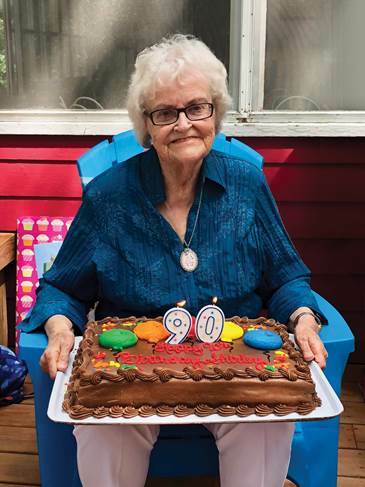 She was in her favorite rocking chair - her spot to spend the day doing her daily devotions, praying for others, having alone time with God and completing her needlework projects. True to her nature, she had just completed a cross-stitch of bible verses for one of her great-grandchildren....down to the last stitch. At her side was her open bible. No doubt she had asked God that very day to be there for others. Now she was with HIM. She was preceded in death by her husband, Bob; son, Dave; sister, Harriet; mother Anna; and father Elfred. She is survived by her brother, Allen Johnson of Edina; daughter Sue (Dennis "Tiger") McLuen of Lindstrom; and sons Wayne (Karen) Seidel of Two Harbors, and Mark (Katja) Seidel of Florence, Arizona; and daughter-in-law Yvonne Seidel of Hudson, Wisconsin. Shirley was blessed with 16 grandchildren and 19 great-grandchildren. The funeral will be held on Saturday, February 2nd at Zoar Lutheran Church in Tofte beginning with visitation with family at 2 p.m. followed by the service at 3 p.m. Memorials preferred to Schroeder Area Historical Society or Zoar Lutheran Church.